Minutes from the Federal Reserve's March 18-19 meeting are set to be released Wednesday, and they could be quite constructive for investors struggling to forecast the Fed's next move. The minutes "always move the market," said Jeff Kilburg of KKM Financial. "Because at the end of the day, the Fed is still in complete control of the S&P 500" (^GPSC). While most expect the Fed to continue to shave $10 billion off of its monthly quantitative easing program at each meeting, the open question relates to the Fed's ultralow target on the federal funds rate. 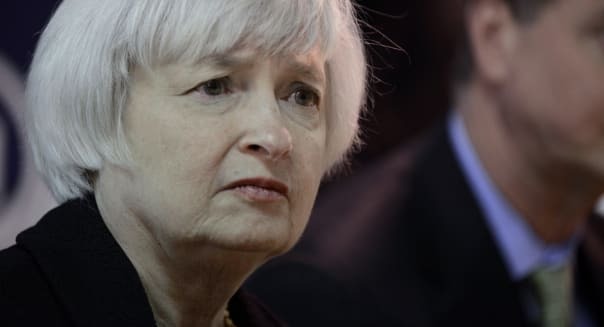 Many were surprised when, in her March 19 post-statement news conference, Fed Chair Janet Yellen said the first rise in the target for the key institutional lending rate could come six months after the Fed wraps up QE. Some reassurance came Monday, when Yellen said the Fed's "extraordinary commitment" to improving the labor market "is still needed and will be for some time, and I believe that this view is widely held by my fellow policymakers at the Fed." What remains unclear is whether this was Yellen's way of walking back her now-infamous "six month" comment. %VIRTUAL-article-sponsoredlinks%But given that the minutes will provide a record of the thoughts presented at the very meeting that Yellen's press conference followed, the document could help investors figure out how seriously this timeline should be taken. "Investors want to know how much 'thought' went into her comment about a possible rate rise in six months," David Seaburg, head of Cowen sales trading, told CNBC.com over Twitter. "The minutes will show." "I'd like to see Yellen's comments on rates to see if she reinforces that six-month period after the taper ends," echoed trader Anthony Grisanti of GRZ Energy. Still, not everyone is confident that anything new will be revealed. In the March meeting, the Fed shifted its guidance on the fed funds rate from quantitative guidance that was based in part on the inflation rate to a more qualitative approach. David Robin, managing director at NewEdge, says discussion of this change will dominate the fed funds rate assessments. "I think the minutes will give very little insight in to the federal funds rate itself," Robin wrote to CNBC.com. "It will be much more informative about the level of debate relative to the shift in qualitative guidance and how that is going to be communicated." Either way, one thing is widely agreed upon: Worries about the fed funds rate now far outpace worries about the future of the fed's bond buying program. "Tapering is sooo 2013," Pimco market strategist and portfolio manager Tony Crescenzi wrote to CNBC.com this past week. "Focus on the policy rate. We see a hike in the latter part of 2015."